Dyslexia manifests itself is so many different ways, but if your child is exhibiting some of these symptoms, they may have dyslexia or a number of other learning disabilities. Some children with dyslexia have difficulty following a sequence of directions, struggle with word problems in math, and have handwriting, or fine motor skills that affect handwriting or the ability to grasp a pencil correctly. Learning and correctly using new vocabulary words can be difficult for some children with dyslexia. For some children, just learning the alphabet is difficult, which leads to frustration when they are faced with new vocabulary words. Not only can the alphabet cause them anxiety and frustration, but numbers, days of the week, similar common word sequences and rhyming can also be difficult. All children learn at a different rate, so it’s important to realize that not all children that have these symptoms are dyslexic, and not all children who are dyslexic will have these same symptoms. Dyslexia is a complex symptom of some learning disorders. Understanding that people with dyslexia experience the disorder differently is crucial in assisting them to read, write, spell, or speak despite having dyslexia. According to the NCLD, the severity of dyslexia and the success of alternate learning methods varies by how the individual is affected by the disorder. Some with dyslexia can have trouble with reading and spelling, while others struggle to write, or to tell left from right. Some children show few signs of difficulty with early reading and writing, but later on, they may have trouble with complex language skills, such as grammar, reading comprehension, and more in-depth writing. While the above information is important to note, there are warning signs that can help identify the disorder. Just keep in mind that not every individual will exhibit all of these symptoms, nor will they exhibit them in the same way. Dyslexia is more than flipping letters, exchanging a p for a q or reversing words. While this is one aspect of some dyslexia sufferers, this is not necessarily the case for all. It’s important to recognize that just because your child confuses m and n or b and d doesn’t mean they are dyslexic. By the same token, a child that does not confuse those same letters, could still be dyslexic. Dyslexia is a general term for disorders that involve difficulty in learning to read or interpret words, letters, and other symbols, but that do not affect general intelligence. It impairs a person’s fluency or comprehension accuracy in being able to read, and can manifest itself as a difficulty with phonological awareness, phonological decoding, orthographic coding, auditory short-term memory, or rapid naming. One in eight people are affected with dyslexia. Unfortunately, dyslexia education is not as widely taught as it should be. 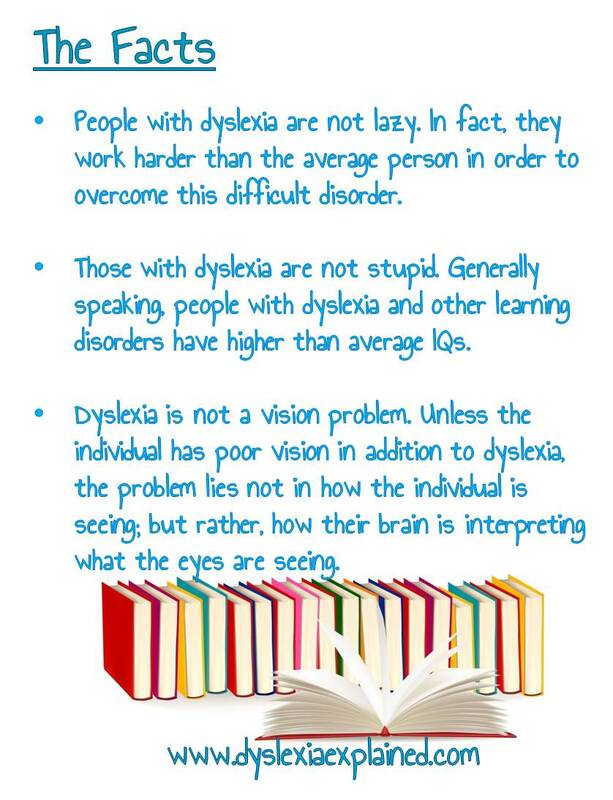 Here at Dyslexia Explained, you will learn the various ways the dyslexia brain is affected when it comes to reading, writing, and math, as well as the options available to dyslexic readers. When my son was reported to have dyslexia, I didn’t know what to do. I knew nothing of the disorder, yet I wasn’t upset – I was relieved because finally I could find a way to help him learn and excel in reading, writing, and spelling. 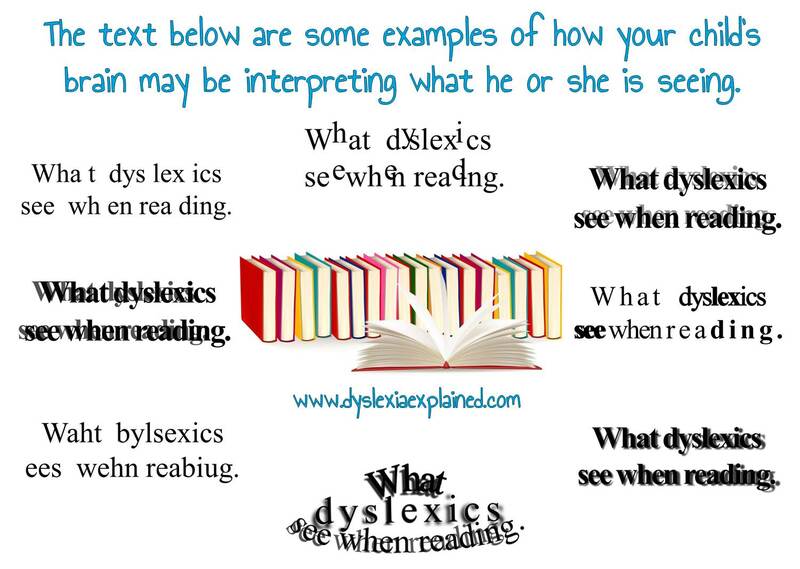 because he or she has LD in reading or writing, but failing to use the methods proven to work for children with dyslexia, rather using methods they would use with the average poor reader who is not affected by dyslexia. I discovered that if I wanted to help my son, I would have to either find a tutor educated in a system created for dyslexia sufferers or train myself to tutor my son.